Hot Chicks Dig Smart Men: New Chair! Right after I left active duty, I was considered part of the "working poor." I lived off of top ramen and frozen pizza, and shopped at Wal-Mart and Good Will. The first six months I lived in my one-bedroom apartment, my furniture consisted of a futon, a lamp, and a television (a GoldStar, from a discount house). The lamp and the television sat on boxes, and the cable was provided for free as part of my rent. I lived like that because the alternative would be not to pay my child support, and I would rather have lived in a cardboard box on the street than done that. Obviously, my financial situation has improved since then, but one of our first Christmases together, I asked my Smart Man for new pots and pans for a gift. He felt a little strange about that, but that's what I really wanted. New pots and pans. Not from the Good Will. Which brings me to yesterday's purchase. Since I work from home and I'm also an on-line student, I spend the majority of my hours sitting at my desk. Since my Smart Man and I bought this house, I've been using a chair he commandeered from his former employer's junk pile. It's actually a pretty nice chair, and it's still in pretty good shape. It's reasonably comfortable, and gets the job done. Prior to that, I was using my Smart Man's hand-me-down. Prior to that, I was using the chair I bought for $29.99 at Wal-Mart. So I wanted a new chair. Not a chair that someone else had used first, or a chair that was appropriated from one of our employers, not a chair that was put together with bubble gum and sealing wax - a new chair, that I picked out just for me. I hope that doesn't make me a greedy materialist. 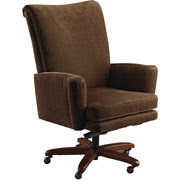 So off to Staples I went, and picked out my new chair. It's squishy. It's covered in chenille. It provides good back support. It's the comfiest desk chair I've ever sat in. It'll be delivered Tuesday. It's new, and it's all mine. Nathan, hopefully not. I'll let you know! That chair looks pretty nice. :) My office chair doesn't have "arms", and I really wish it did. And honestly, I wish I still lived my Tom Ramen lifestyle on my current income. I think we'd have a lot more in savings!!! Shawn, I'm a compulsive saver, and we live far below our means as a result of those top ramen years. I never want to live on that knife-edge again. And yeah, new chair. Yay! The chair ought to be tax-deductible, too! No, you are not a materialist. My wife and I have the same neuroses from years of living on grad-student stipends. We have to justify every major purchase we make to each other. John, none of my V.O. expenses are tax deductable, unfortunately. Every year I go through the check-list, and every year, I don't qualify. Now I am SURE I could have gone down to the base and found you a perfectly great chair from one of teh shops there.... just offering, of course. It looks great! And that back support is the greatest thing since sliced bread, now that I am in my "comfortable years". Amy, it must be new. And ALL MINE. 'Cause I'm a greedy materialist. Comfy computer chairs are most important! And anyone who doesn't want chairs with arms can send 'em all my way. I sit indian style (Is there another name for that? Is that OK to say? AM I now a bad person?) so arms are just in the way.